Tap repair in and around Lincoln, fixing that annoying drip. Dripping or leaking taps can be more than an annoyance, they can also lead to further problems including damage to your property. Our plumbers can attend your property to isolate any severe leaks and carry out a tap repair in the shortest time possible. There are essentially two types of tap: traditional taps and monobloc lever taps that control flow and temperature with a single handle. 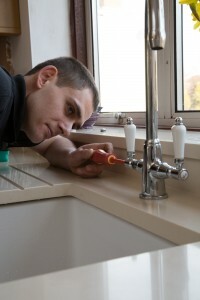 Traditional taps drip because an internal rubber seal, or washer, has perished and needs replacing. Monobloc lever taps have ceramic cartridges that occasionally need to be replaced. The more expensive the tap, the more extortionate and elusive the replacement cartridge. When you need a tap repair, our Plumber will first diagnose what is causing the dripping or leak, and then carry out the recommended repair to prevent this from happening in the future. Our Plumbers carry a range of materials (including tap washers) and stock to tackle most tap problems during the first visit. It’s often the case that you don’t want to turn off your whole mains as this will leave you with no water at all. So under sinks, attached to taps, there are usually isolation valves (sometimes called ‘service valves’). Stopping the flow of water from your taps is really easy. 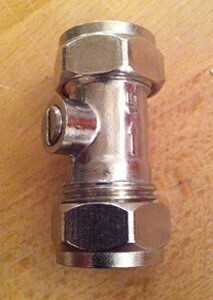 Look at the isolation valve. You can see what looks like a slot-headed screw. If the slot is parallel with the arrow on the valve, the water is flowing through the pipe. To stop it, take a flathead screwdriver and turn the slot 90 degrees (a quarter turn) so that it’s perpendicular to the arrow. Isolation valves should be attached to every water-using appliance or fixture in your house, so you should be able to see them under taps, dishwashers, washing machines, toilets, showers, etc. Be aware that isolation valves can vary in size, but they all work the same way.